The Camp Chef Lid Lifter is the perfect aid in picking up your dutch oven lid while you cook. 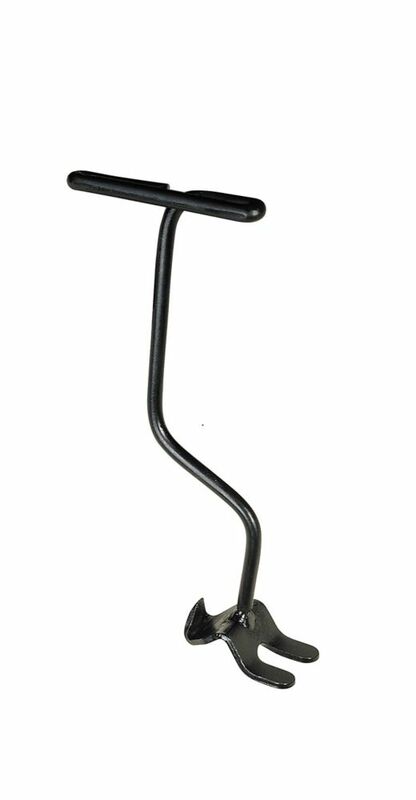 This lid lifter comes with our DO line of dutch ovens. but if you misplace one or need an extra one, it's the perfect tool. Prepare even more delicious, hearty meals with a classic deep Dutch oven. This five quart, 10 inch deep Dutch oven will give you more space for any of your family favourite recipes. This Dutch oven piece has an image of a pronghorn etched on the lid maintaining an outdoor feel. Part of Camp Chef's commitment to producing quality cast iron products is preseasoning all cast iron with its own True Seasoned Finish so it is ready to use out of the box. This 4 inch skillet is a great candy dish or decoration for the cabin and it's perfect for baking a single serving cookie. Like all Camp Chef's cast iron products, this mini skillet is seasoned a True Seasoned Finish giving it a natural surface that is ready to use out of the box. If you like this, you might want to check out our mini Dutch oven (DO5). The single burner Barbeque Box (model BB100L) turns your outdoor gas stove into a portable barbeque grill. This grill system will outperform anything you've used. With the patented diffuser plate you don't have to worry about hot spots. The diffuser captures and vaporizes the grease, infusing your food with a rich BBQ flavour. The cast iron cooking surface holds the heat and sears the meat. A vented lid is included to help keep the heat in. This system covers one burner on both the 14 inch and 16 inch Camp Chef Cooking Systems. Dutch Oven Lid Lifter The Camp Chef Lid Lifter is the perfect aid in picking up your dutch oven lid while you cook. This lid lifter comes with our DO line of dutch ovens. but if you misplace one or need an extra one, it's the perfect tool. Dutch Oven Lid Lifter is rated 5.0 out of 5 by 2. Rated 5 out of 5 by Sunnydee from lid lifter is a must for dutch ovens We realized we needed a lid lifter for our Camp Chef dutch oven when my husband had a bad experience because of a lack of having a lid lifter. A month ago on one of the "doneness" checks, the lid was lifted but wasn't stablized with the tool he was using and it got bumped off level and many of the coals slid into the peach cobbler that we had planned on serving at our campsite. So he dumped the peach dessert and when we got back from camping, I got online as soon as possible to order a lid lifter. We recently used our new lid lifter and it works perfectly! I am so relieved that we won't have to dump our dutch oven recipes from now on. I think it would be a good suggestion to get the lid lifter from the company who made your dutch oven. Rated 5 out of 5 by Candise & Crew from Good for Scouts camping My son is a very active Boy Scout with monthly campouts. This tool is essential for campfire cooking and keeps heavy lids with cast iron pots more secure. it was cheapest on the website, but I wish it came as a set with a dutch oven or pan.